There is a (Team) Deathmatch, Capture the Flag, Wargames, and Assault Capture the Flag. Multiplayer supports up to 16 people, and 4 players for three co-op missions. 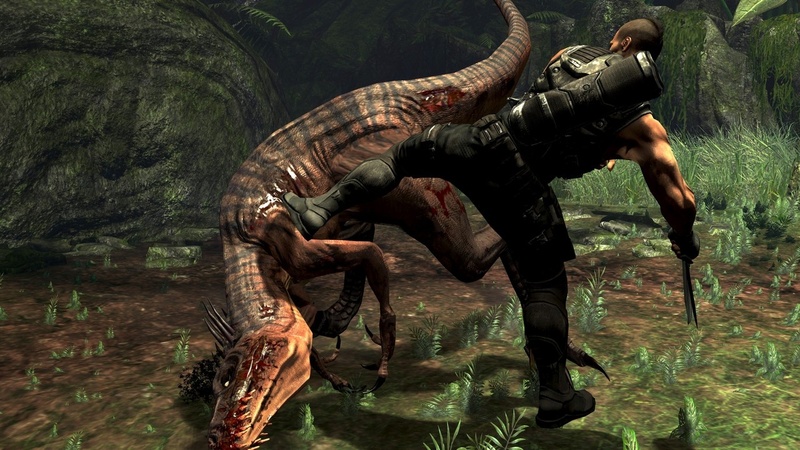 A feature in the multiplayer - randomly spawning computer-controlled dinosaurs and insects that appear in various locations in levels - adds a new factor to the gameplay, and has not appeared in first person shooter games since Doom. 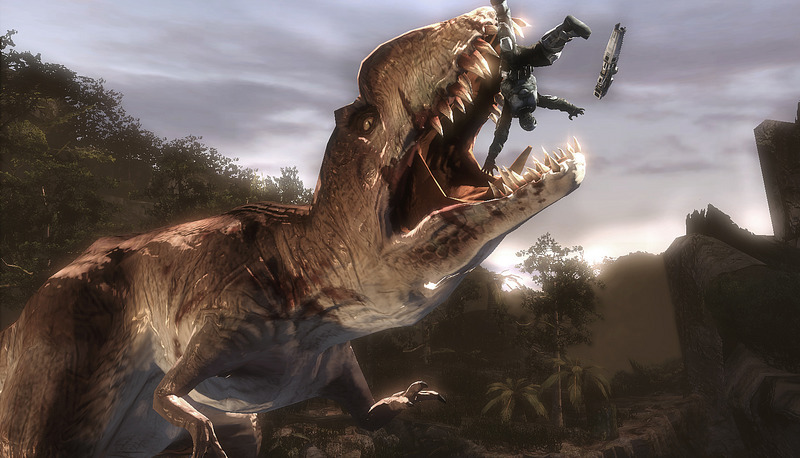 While players must worry about the opposing enemies, they must now also worry about the hostile dinosaurs that will be attempting to kill them. There can be up to 4 A.I controlled dinosaurs or insects on any map at one time. Joseph Turok - Joseph Turok is the main character of the game and the strongest member in Whiskey Company. He has a shady past as part of an elite fighting force known as Wolf Pack which he was abandoned after becoming disgusted with his mentor Kane's total amorality. The game confirms that he is Native American. Slade - Slade is often paired with Turok throughout the game, and he has a strong hatred for Turok because he feels Turok is responsible for his brother's death. Warms up to Turok after Turok goes out of his way to save his life from a large aquatic monster in a cave even after Slade had abandoned Turok. He escapes in a ship with Turok and Shepard. Slade's name may be a nod to another Ron Perlman character, Slade from the Teen Titans TV show. Logan - Unofficial Whiskey Company leader. He assumes command after all officers are killed. As the game progresses he becomes increasingly unstable. As a result he orders an insane suicide mission and then starts acting incredibly paranoid accusing Turok of treason when only he and Slade make it back. He then reveals the position of the remaining Whiskeys to M-G Corp and picks a fight with a large enemy patrol, he is killed when shot by a helicopter soon after when trying to destroy it. His name is most likely based on one of Wolverine's aliases. Cowboy - The most calm and cool-collected member of Whiskey Company. He is well respected by all of its members. Executed by Kane after speaking out. Jericho - A strong, heavy weapons foot soldier. He fights until the very end and is willing to die for his companions. He is last seen holding off Kane's men so Turok and Shepard can escape underground. Whether he is alive or dead is unknown. Reese - Reese is quiet, even tempered and a loner by nature, Reese is Whiskey Companys sniper. Slender and agile with a deadly accurate shot from almost any range, Reese is the cornerstone of the team. Gets killed by an arrow through his right eye, presumably by Grimes or Kane. Shepard - Technician of Whiskey company. Always wears a hat. He escapes in a ship with Slade and Turok. Henderson - A ranking officer in Whiskey Company, seems to be second in command to Cole. He wears a green beret and sun glasses. He is killed when Wolf Pack attacks the camp. Gonzales - A soldier sent with Turok to locate the COM unit. After discovering the COM unit he is carried away and killed by the T-rex. He was best friends with Slade. Foster - A soldier sent with Turok to locate the COM unit. During the trip he is instantly killed by a sniper bullet to the head. Parker - The Whiskey Company's medic, he attends to Cowboy after he is shot by Grimes. He is killed when Wolf Pack fires into the Whiskey Company camp with Mini-Guns. Cole - Official leader of Whiskey Company. Is pierced through the abdomen by an arrow shot off by John Grimes, spawning a battle. Carter - Sent with Turok and Slade to see what was making a light in the jungle. He was dragged underground and killed by Soldier Bugs in the chapter "The Shortest Straw". Luis - A Soldier that does not play any speaking roles. He is killed when Wolf Pack attack the camp. Beau Stanton - Was another heavy gunner for whiskey company. After the battle spawned in the camp by the M.D. 's he soon dissapears. His status was released as M.I.A.